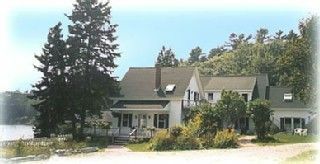 Coveside, a Sea Captain style home, is located on Southport Island/Southport at Deckers Cove, along the beautiful coast of Maine, approximately an hour's drive north of Portland Int'l Jetport, and within minutes of Boothbay Harbor. The facility occupies over 1 acre of land graced with lawns, and gardens. The apartment has a private, separate entrance, is fully furnished with clean/modern bathrooms ( 2 ), bedrooms ( 2 ), living room, dining area, and fully equipped kitchens. Ample private parking is available on the grounds. There is also a dock for small boats and kayaks, available for use by our guests. There are additional apartments in this home, all listed on this site ( 155226,155227,155228 ), which makes it ideal for family holidays/reunions, group gatherings and wedding parties. A warm and friendly atmosphere exists for both children and adults. Ideal for Families, Small or Large. : The facility is ideal for small or large family gatherings as there are 4 totally independent apartments in this home ( prop nos 155226, 155227, 155228, 303368 ). The larger gathering will find the layout affords independence and yet dinning table in Apt 1 ( refer photos ) can seat 8 people plus kids. There is also extensive outdoor decking and garden area for children to play, and for family BBQ's ( 2 gas BBQ's and picnic tables ). Area: Breathtakingly beautiful scenery and the simple good values of the people of Maine will keep you coming back to this wonderfully serene area. We are the Cheema's...Jane and Inder. One from Canada, and the other from Kashmir, India. Came to Southport in 1978 in search of a home base as we worked mainly overseas, and as the saying goes, the rest is history. Retired from ExxonMobil in 2000. Children and grandchildren are with us every summer, so life is great. Close to our home which is also on Southport; sounded like a challenging post retirement project, which it was. Serenity of Southport Island, with the hustle and bustle of Boothbay Harbor and associated tourist activities, available at arms length or a 7 min driving time. Southport has it all : kayaking, boating, sailing, walking/hiking, biking or simply lying on our many decks, in the sun or rain, or whatever. The is a resort area with an abundance of marine and land based activities. Major sailing center. Great golf. Outstanding Botanical Gardens. Southport Island might be called rural. Two miles up the road form Coveside House is the post office, a one house elementary school, fire station, and general store. Further on is Cozy Harbor with Oliver's restaurant and a sailing school. Refer ' Ocean View ' above. Coveside House Fronts on Deckers Cove which leads to the open ocean and inland waterways/ islands. Two kayaks provided for our guests use. Property looks onto Deckers Cove which leads to the open ocean ( refer aerial photo ). Float/dock accommodates small boats, canoes, and kayaks....two kayaks are provided for our guests use; boats and canoes are available for rent in Boothbay Harbor. Southport is an island about 6 miles long and 2 miles across at its widest. Access is by means of a swing bridge which opens on the half hour for boat traffic. The serenity of this island setting is augmented by nearby Booth bay Harbor and its varied marine activities, restaurants, art galleries, shops, antique stores, live theater, movie theater, aquarium ,etc. For families with children the nearby beach at Hendricks Head is fun and picturesque.Biking enthusiasts have various possibilities on and of the island. Small boats, kayaks, and canoes can tie-up at our dock from where access to the open ocean and surrounding islands and waterways/coves is feasible and safe. There is much to be explored on the island...a quaint seaside church, the landing at Newagen and its bold ocean views, hiking trails, a historical museum, a town library, and a couple of picturesque harbors. Both formal and informal dining is within walking distance of the home. Golf: A challenging and well maintained 18 hole golf course is within a 10 min. drive; includes golf school/academy .